This weekend has been little short of a Fantasy Klezmer league for Kleznerds. Who would you most love to jam with? Who is your dream backing band for your version of "Vu bistu geven"? To whose process would you most love to be privy? And, lastly, with whom would you most love to chat Klezmer - style, material and interpretation - over sandwiches and coffee? 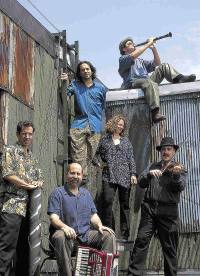 For today's Klezmorim the answer would be every time The Klezmatics, New York's best loved Klezmer band. My synagogue is active in an interfaith social justice group called the "Greater Boston Interfaith Organization" (GBIO). I recently attended an event involving dozen's of faith communities around the Boston area in support of a couple of causes important to all of us. To my surprise and pleasure, the chorus singing organizing songs and Yiddish folksongs on the stage was none other than Boston's own Workmen's Circle Chorus. Of course, they were doing nothing other than what they have done since the first socialist secularists founded the Arbeiter Ring (Workmen's Circle) 100? 200? years ago: celebrating Yiddish culture and singing, as expected, for social justice. I was temporarily taken aback by the notion of them joined together with explicitly faith organizations, but realized that faith has many meanings, not all of them tied to ritual spiritual practice. It was not a profound event, or a profound moment; rather a pleasant reminder that our sense of faith has grown, as has our ability to work together for social justice and for social change. Absent was polarizing insistence of "under god" (consider the recent Supreme Court case on the subject) or fear of "godless Communists aka socialists". Instead, the Workmen's Circle Chorus was reminding us, as did the gospel trio that followed them, of all that unites us, instead. For more information on GBIO (nothing on Jewish Music, alas—not even klezmer), visit their website. For Yiddishkayt, you'll have to visit the Workmen's Circle website. I have been sitting here most of the night waiting for my printer drivers to finish installing. If HP made printer drivers the way they make printers, this would be working hours ago. But such is not my fortune. 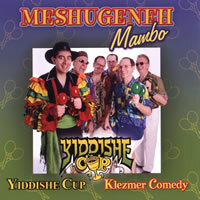 On the other hand, it has given me lots of time to really, really listen to the new Yiddishe Cup CD,"Meshugeneh Mambo." in which they successfully channel the late Mickey Katz. Oy, what a metziye! This is the most outrageous combination of fifties Borscht Belt shtick and postmodern Jewish deconstruction I've heard in years and boy did we need it. I'm going to review this 'real soon now,' but don't wait. You can order copies now from CD Baby. Why wait for me to get my act together. Mickey Katz is kvelling in a flying shisl somewhere out there and he's urging us all to "essn, essn." But not even Mickey would have dreamed up "I am a Man of Constant Blessings", and unless his son went to Tufts or Brandeis (like, say, the son of a certain bandmember of my acquaintance), we'd miss out on a very straight, delightfully a capella "Oseh Shalom." But what the heck. If uncontrollable laughter is what you need, just hang in there—the "Knish Doctor" will be up shortly.